played by the members of Al 'Azifoon. Shaped like half a pear with a short fretted neck, the oud has five or six pairs (or 'courses') of strings played with a plectrum - originally a trimmed eagle's feather, but now normally made of horn or plastic - producing a deep and mellow sound. Virtuosos across the Middle East refer to it as 'the King of all instruments.' The neck of the oud is fretless, like a violin, which allows the player to produce a very expressive tone and to play any of the notes in the quartertone Arabic scales (or maqams). The English word lute, which derives from the Spanish laud, originally came from the Arabic al-'ud, literally meaning 'branch of wood.' Between the eighth and tenth centuries, the oud had only four strings; a fifth was added in the eleventh century by Zeryab, who was originally from Baghdad and brought many innovations to the Andalusian courts of southern Spain, and a sixth later on in the fifteenth century. 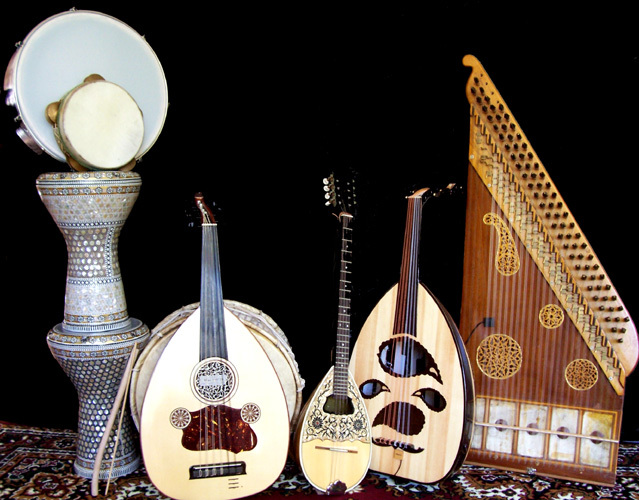 For lots of great information on the oud, please see the Mike's Ouds site! 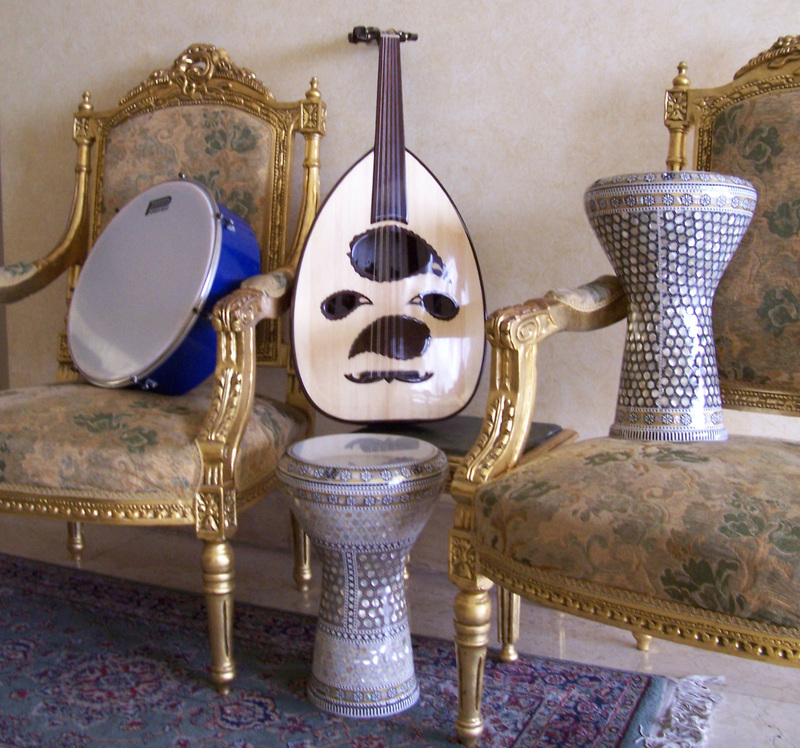 There's also more oud info on the Atlas of Plucked Instruments site. 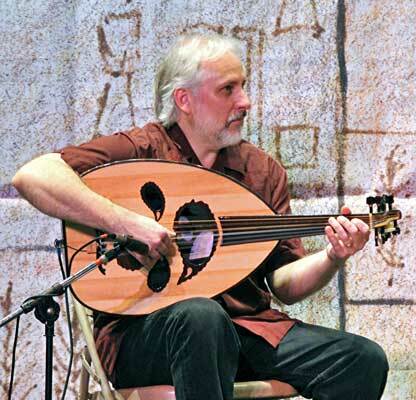 VIDEO: Paul demonstrates the oud for the Gilded Serpent at Middle Eastern Camp. The qanun is a descendent of the old Egyptian harp and has played an integral part in Arab music since the tenth century. A kind of dulcimer, its Arabic name (from Greek) means 'rule' or 'law.' The qanun was introduced to Europe by the 12th Century, becoming known during the 14th to the 16th Century as a psaltery or zither. The form of the qanun consists of a trapezoid-shaped flat board over which 64 to 81 strings are stretched in groups of two or three to each note. The instrument is placed flat on a table or the knees of the musician. The strings are plucked with the fingers or with two plectra, one plectrum attached to the forefinger of each hand. Here's the Wikipedia article on the qanun. The tabla is a small hand-drum, also known as dumbek or darbukka. One of the most commonly played of the percussion instruments, the tabla is a membranophone of goat or fish skin (or plastic) stretched over a vase-shaped drum with a wide neck. Usually made of earthenware or metal, it is normally held on the left leg (for right-handed players) and struck in the middle for the strong beats (dum) and on the edge for the sharp in-between beats (tek). 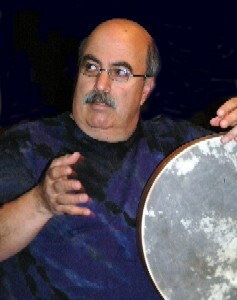 NOTE: the Egptian tabla is not to be confused with the Indian tabla, which is constructed and played much differently. 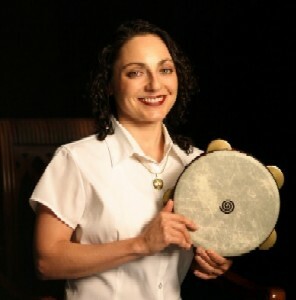 The duff is a round frame drum, covered on one side with goat skin (or plastic). The duff is also called daff, deff or tar. It is played either on the knee, between the legs or held vertically by one hand. The duff generally keeps the basic rhythm but can also be played either solo or in a group to play very intricate rhythmic patterns. The riqq is the Arabic name for the popular instrument corresponding to the English tambourine. It consists of a round frame, covered on one side with goat or fish skin (or plastic). Pairs of metal discs are set into the frame to produce the jingle when struck by the hand. The sounds of this percussion instrument set the rhythm of much Arab music, particularly in the performances of classical pieces. ~ A great article from Saudi Aramco World magazine on where to find Arabic music online! ~ Do you need instrument strings for your musical Near Eastern, Middle Eastern, or Western instruments? Pyramid Strings, www.pyramid-saiten.de, sells the highest quality strings for ALL stringed instuments -- including Arabic ouds, Arabic qanuns, Turkish ouds, Turkish kanouns, as well as Persian, Afghani, Indian, other ethnic musical instruments, and Western instruments such as guitars. Additionally, Pyramid Strings makes custom strings sets exactly according to customer specifications. Pyramid Strings offers fast, courteous service, and they charge very reasonable rates on international shipping! If anyone needs nylon or any size of copper wound silk/nylon fiber core strings for Qanun or Oud or other Near Eastern instruments, contact Pyramid Strings. For custom string sets, measure the strings with a dail or digital caliper and send Pyramid Strings the measurements in MM. Pyramid Strings can make custom strings sets for you of just about any length or diameter. ~ Do you need 25 foot bulk nylon instrument strings for your musical Near Eastern, Middle Eastern, or Western instruments? Buy uncut nylon harp strings of the appropriate gauge from Robinson's Harp Shop, www.robinsonharpshop.com.